Aww disappointed it isn't a hot London Grammar cover :'( ;) :P<br><br>Anyway it's alright but I prefer all of the other songs I've heard from the album apart from "Best Song Ever". ▒ Wederom géén bijzondere track (en voorloper) van hun nieuwste album: "Midnight Memories" (eind november 2013), door de Britse jongensband: "One Direction" !!! Méér dan twee sterren vind ik persoonlijk ook een beetje overdreven ☺!!! 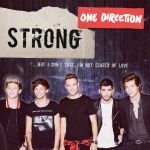 Prima albumtrack, die in de belangstelling staat omdat het nieuwe album van One Direction onlangs is uitgekomen. Een chartpositie is eigenlijk wat overdreven, maar met dit nummer is op zich niks mis. One of the best tracks on the album, this has a far amount of hit potential and hits a slightly different sound/vibe than what we are used to from 1D. Jede Woche tauch ein anderer Song von denen in den Charts auf - und verschwindet schnell wieder. Da das meiste eh alles gleich klingt, vermisse ich die Band aber nicht. Der ist schon sehr nett, wird wohl aber in den nächsten Wochen durch massives Airplay untergehen. immer die gleiche Machart, nicht meine. I really like this, it's one of the best songs on the album, even though it irritates me a little that it reached #1 in New Zealand. ..ist nicht meine musik-richtung,<br> aber dieser song hat was gutes..
Good but the music sounds a little like the Kelly Clarkson song 'Stronger'.<br><br>1 week in the UK top 100.<br><br>UK#48 and Ireland#22.<br><br>US#87.<br><br>World Chart Year End (2013): #99.